The Larry Dollison Food Cooperative Fund was established by Cornelius and Mary Dollison in loving memory of their son, Larry Dollison, who passed away unexpectedly in November 2015. “With the loss of our son, we decided that in lieu of flowers we would start a fund where people can contribute. This will mark an honorable tribute to our son and his legacy for the things that he really wanted to see happen in the community,” explained Mr. Dollison. He continued, "Larry was always concerned about food insecurity issues in the community. He talked about the food desert in our community all of the time." The Dollisons felt that establishing the fund was the best way to contribute to their son's desire to see impact and resolution around food insecurity in the community. “We were pleasantly surprised how The Community Foundation supported our effort of having this endowment here to address the food insecurity needs in the community,” said Mr. Dollison. Mr. Dollison was born and raised in Muncie, Indiana. Mrs. Dollison, born in Louisiana, came to Muncie when she was 12 years old. They both are actively involved in the community. 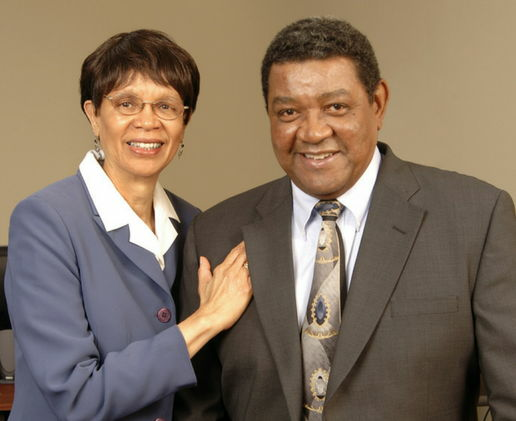 “We have always worked to help make lives better in our community,” said Mr. Dollison, who served on several boards including the board of Muncie Action Plan (MAP), which works to move our community forward with strategic plans. After completing her education, Mrs. Dollison worked as a teacher at Longfellow School. She taught for 35 years and continues to be an active volunteer in the community. She is the co-founder of Motivate Our Minds (MOMs) and says that The Community Foundation was one of the first organizations that helped MOMs. Larry was such a giving person and the Dollisons hope to continue doing the same through this fund. “Building relationships is one way we are rewarded by reaching out to the community and helping others. We expect this fund to grow and reach out to many,” says Mrs. Dollison. “The Community Foundation has now become a foundation that is keeping the community together in a sustainable manner. It’s an entity that is trusted by all because of their transparency and helping everyone,” says Mr. Dollison.